A new study from credit bureau TransUnion revealed that consumers still don’t get it when it comes to smart credit habits. Conventional wisdom tells us to halt or limit spending during the lead up to a mortgage application, whether it’s a purchase or refinance, but a lot of folks seem to ramp up spending during this critical time. 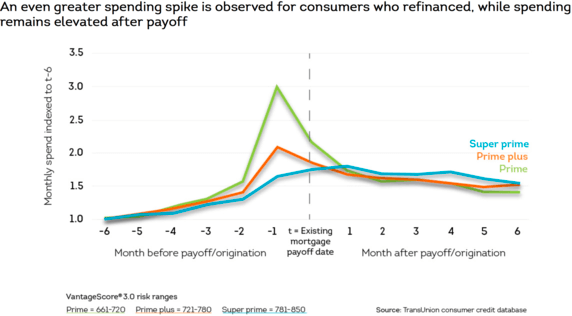 The company discovered that those who refinance their mortgages greatly increase credit card spending in the month prior to loan payoff, a departure from long held assumptions about credit behavior. They found this out after combing through data from some 16.7 million credit files where a mortgage was paid off and subsequently replaced with a new one between the first quarter of 2013 and the second quarter of 2015. Amazingly, consumers who refinanced managed to increase average monthly spend anywhere from 1.7-3X their typical spend in the 30 odd days before closing on their refi. It’s as if they knew they were either going to get a lower interest rate, and thus a lower monthly housing payment, or were expecting some cash out, so they could go buck wild. Unfortunately, this is the last thing you want to do when applying for a mortgage. Can You Just Wait a Month! Whatever happened to patience? I mean really. You can’t wait a month to buy that new big screen TV or fancy leather couch from Restoration Hardware? You do realize your credit score can tank if you increase spending on your credit card(s) before and during the loan process, right? I proved that when I spent a ton over the holidays. My credit score plummeted to the point where I would have had to accept a higher mortgage rate had I refinanced around that time. Of course, I knew I wasn’t refinancing so it wasn’t a concern for me. As expected, borrowers in the “Prime” credit category, characterized as those with 661-720 credit scores, made this mistake the most, at least when compared to those in the “Prime plus” and “Super prime” categories. Those latter categories include borrowers with credit scores from 721-780, and 781-850, respectively. So prime really isn’t that good…it’s just above subprime (620 cutoff) depending on how prime you actually are. Some we’re probably lucky to still get approved! The Prime folks tripled their credit card spending during the month before refinancing, and once they got their new loan (I’m glad it all worked out), spending remained elevated for many months afterward. The Prime plus band saw spending more than double its monthly average and it also stayed elevated. The Super prime peeps were a bit more responsible, only increasing credit card spend by about 1.7X. Still, in every case these borrowers were committing a cardinal sin – you don’t increase spending before a refinance. For one, it can tank your credit score, sometimes significantly depending on how you spend. For example, maxing out one credit card is a big no-no. As a result, you might get hit with higher pricing adjustments and thus wind up with a higher mortgage rate. So your lack of patience landed you with a mortgage rate of 4.25% instead of 3.75%. Good job. That’s your rate for the next 30 years. Secondly, it can limit your borrowing capacity because you’ll have higher minimum monthly payments related to those tradelines. If you’re on the cusp of approval DTI-wise, it could potentially make a difference, especially if your mortgage rate is also higher to boot. The solution is really, really simple. Don’t swipe before you refi…that’s it. Just lay off the spending for a month or two and once your loan funds you can go nuts. Or even go a step further and pay down your debts before refinancing to lower your DTI and potentially improve your credit scores to receive a more favorable interest rate. By the way, the study also found that prime or better mortgage applicants are 50%+ more likely to open a new credit card during the 12 months following a mortgage inquiry compared to the rest of the population. That actually makes sense. Read more: Reasons why you can’t refinance your mortgage.